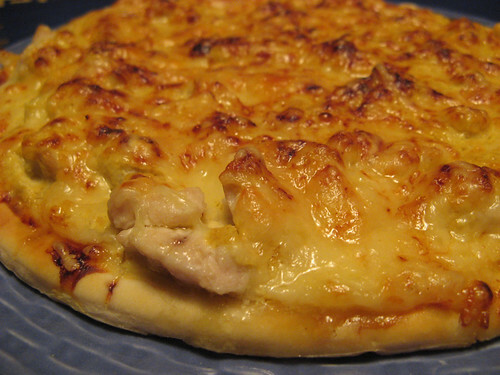 This is a recipe I developed inspired by a chicken curry pizza I ate in a pizzeria in Gandía, Spain. But despite the chicken and the curry, there are very few similarities, as the pizza I ate had tomato sauce and didn’t had onions, so I can say this is an original one ^^. You can prepare this pizza in just 20 or 30 minutes, including the oven time, so I think it’s a more or less fast recipe, and of course, it’s quite easy to prepare it, and very delicious. This is for 1 or 2 people, depending on how hungry you are, hehe. Note that the pizza in the pics seems to be small, but it’s the dish that was very big. Cut the chicken into small die, put them into a frying pan with a little bit of oil and cook it in medium heat until it starts to golden. Put the chicken in a dish. In the same frying pan, put the cream, add some curry powder and cook it in medium heat, stirring constantly. The mix has to have a taste of curry, but not very hot. Keep cooking it until it becomes as dense as a fried tomato sauce. 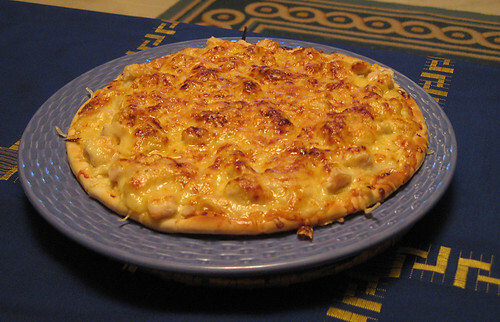 Cover the pizza base with 35-40% of the curry sauce, put the mozzarella, cover it with onion (1/3 or 1/2 onion is ok), add the fried chicken die, cover it with the rest of the curry sauce and add the emmental cheese. Put the pizza in the oven and cook it for 10-15 minutes, until the emmental is crisp. Actually, it’s better is u fry the chicken until it turns white (not pink/yellow/…) cause if u wait until it becomes golden, it will be pretty dry for a pizza. At least, that’s how i rememeber it. Una de dos (one of two). O eres muy malo sacando fotos (or your are so bad taking out photos) o esa pizza parece una tortilla de patatas bastante chunga (or this pizza seems a spanish omelette very chunga). Weelsha, we didn’t fried it until it it goldened, when we put it in the pizza it was still white, a little bit undercooked for me.